Gas Boosters are designed to raise the pressure of gas supplies to provide sufficient combustion or use smaller sizes for pipework, valves etc. Based upon centrifugal fan designs they give a high performance from a small physical size. They occupy less space and have lower power consumption than equivalent direct drive boosters and our latest designs have lower noise levels. Secomak gas boosters have been leading the market for over 40 years across many industries worldwide. 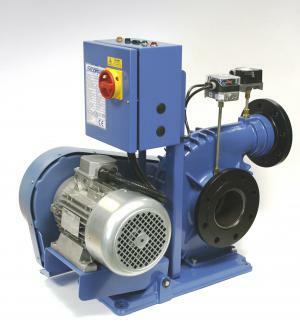 Secomak Gas Boosters are based on centrifugal fan designs and give a high performance from a small physical size. The Secomak layout occupies less space than direct drive boosters of conventional design and comparable performance. Packaged gas booster units come complete with all necessary controls. These include start/stop facilities from either, the booster or a separate management panel, overload protection and pressure switches for the inlet and outlet of the booster. The only work required for installation is to supply the appropriate electrical power and mechanical connections to the booster. An automatic changeover unit is available for installations where a duty and standby unit is installed. This will automatically switch on the second unit if the main booster fails and provides a visual warning that attention is required. Booster fan chambers are cast in either aluminum alloy or cast iron and manufactured to eliminate porosity. Impellers are also cast in aluminum and are dynamically balanced to cut down noise and vibration. Booster fan bearing housings are manufactured in steel for mechanical stability and each fan chamber assembly is sealed for gas tightness and individually tested for leaks with air at 250mbar. An automatic belt tensioning arrangement is used on all models in the range. This has the benefit of low maintenance and fast and simple belt replacement. All models are suitable for use in ambient temperatures up to 40°C and are continuously rated. Motors are T.E.F.C and are protected to IP54.